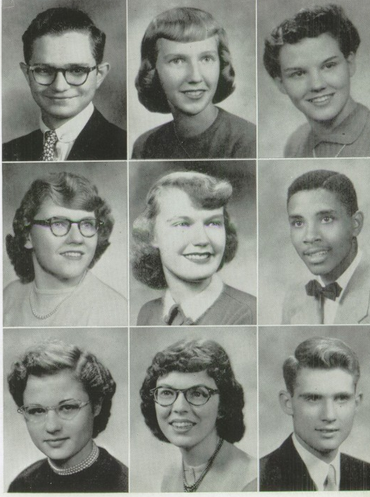 One of my favorite things to do as a child was to browse through my mother’s high school yearbooks. I remember looking at the photos of the teenagers, reading the blurbs under each photo and anticipating my own high school years. In at least one of the yearbooks the students were asked their pet peeves and they were listed under their photos along with their academic and extracurricular highlights and ambitions. I focused on these pet peeves of the Elgin High School students in the early 1950s. Because I was on a sort of quest to become perfect I made a list of them in a notebook to make sure I did not ever do whatever these students found annoying. The only two I remember were: “Wearing pink with red” and “The song, ‘June is Busting out All Over’”. I vowed to never be caught wearing pink and red at the same time or ever singing the song “June is Busting out All Over”. The others were similar – simple things that teenagers of the time just didn’t like. Nothing mean about them – just something fun for the yearbook. I however, took it to heart. I never did become perfect, and probably threw out the list because I realized it was silly, however you’ll still never hear me sing “June is Busting Out All Over” or wearing pink and red at the same time. Fast forward several decades. Now, instead of my mother’s yearbooks, I like to browse the Internet. I usually start with Facebook – the yearbook of the world – and read what people are doing and what they are thinking – some of which are pet peeves. 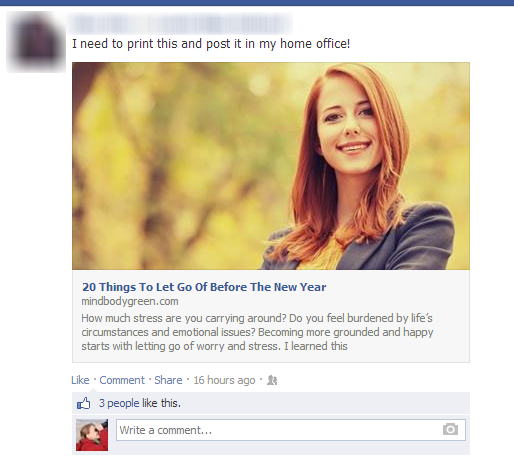 Sometimes people post links to lists of what might be considered pet peeves. I no longer keep a list of what I should be doing or should not be doing to make my fellow man happy, but I do take a lot of things to heart, just as I did with the pet peeves from the 1950s. If a Huffington Post contributor suggests I not comment that the weather is wonderful where I am when someone posts a photo of a thermometer reading below 0 degrees F, I’ll try to not do that. If I know that one of my Facebook friends hates it when I cross post from Twitter to Facebook, I’ll stop. If my brother doesn’t like my political views, I’ll either stop posting them or not include him in the group of people by whom the post is seen. In addition to simple pet peeves, there are also the PC kind. These are more dangerous to ignore. For instance is it Merry Christmas or Happy Holidays? No matter what you say you are bound to insult someone. I used the term “Christmas Tree” in a post a week or so prior to Christmas and someone responded, “What’s Up?” which made absolutely no sense to me in the context of my post. I worried that he might be Jewish and be insulted that I said Christmas Tree instead of Holiday Tree when talking about a decorated evergreen in a public place. Once, on a private forum, someone said that using the prefix “uber” to mean “very much” was disrespectful because it was used in Nazi Germany. I don’t ever use “uber” because of that. I can’t tell you how many times I’ve written an innocent response to a Facebook post and ended up deleting it because I was afraid it would somehow be taken the wrong way. One of my greatest concerns is hurting feelings or annoying someone. I could go on and on but I am sure someone, somewhere has a pet peeve about long blog posts with too many examples. I think you get the picture and I need to realize that you can’t please everyone all of the time and be it pet peeves from the 1950s or opinions of Internet entities or Facebook friends – I should just relax and not worry so much. Or should I worry more? It certainly gives my time on Facebook a different flavor. What do you do in these situations? I like long blog posts, and the more examples, the better. And depending on their respective shades, pink and red can look good together.